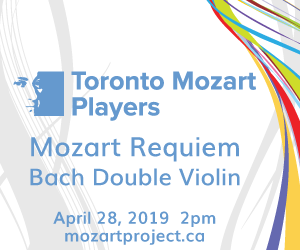 May 3 there will be a concert that will feature the music of the German-born Montreal composer, Wolfgang Bottenberg, presented by Alex and Nadia Jacobchuk, under the auspices of the Etobicoke Music Festival. Born in Frankfurt-am-Main in 1930, Bottenberg came to Canada in 1958, and began formal musical studies at the University of Alberta, then at the University of Cincinnati. He began his teaching career at Acadia University in 1965 and retired as a full professor from Concordia University in 1997. He views the early twentieth century as a time of “super romanticism,” which he explains as “putting originality before craft,” with “problematic” results. For the past ten years he has set himself the challenge of seeing whether it is still possible to compose tonal music, using the techniques of the eighteenth and nineteenth century masters, that also relates to contemporary sensibilities. “An amalgam of Schubert and Brahms” is how he puts it. I have always been interested in the idea – expressed by such different thinkers as the English editor Alfred Orage and the Russian writer Boris Pasternak - that by absorbing an artistic tradition an artist gains access to the new and the original. Listening to a CD of Bottenberg’s music, I found myself feeling that he is engaged in the journey of discovery that they wrote about. When the singer knows how to communicate with an audience, including adjusting his/her voice to the dimensions of the hall, and the collaborative pianist is truly collaborative, there is nothing better than a vocal recital. The first vocal recital of the month in Toronto or beyond is soprano Melanie Conly’s performance for Syrinx Sunday Salons on April 5 of André Prévost’s Improvisation for soprano, Samuel Barber’s Knoxville – Summer of 1915, Kurt Weill’s Youkali and Debussy’s Ariettes Oubliées. Melanie’s thoughts on the program are that it is about the tension between the innocence of childhood and young love and the inevitable disillusionment that comes with experience. The Barber piece, she told me, with its movement in the text between the author’s childhood voice and his adult voice, captures this most poignantly, as does Youkali’s evocation of longing for an unattainable peace and harmony. Again I invite you to peruse (or search) the listings for the wealth of vocal recitals this month. Performances by young people pop up in interesting places this month, beginning with the Toronto Secondary Schools Music Teachers Association annual showcase on April 2. The Toronto Symphony Youth Orchestra has a dynamic month, with two concerts, one on April 17, the second on May 2 and a third with the Toronto Symphony Orchestra on April 25. Students from Toronto and area Suzuki schools are performing in honour of Dr. Suzuki on April 19; and on April 24 the Toronto Youth Wind Orchestra is joining forces with the Canadian Brass, who, as we know, got their start doing school concerts. Other collaborations between adults and children will be the Masterworks of Oakville Chorus and Orchestra with the Oakville Children’s Choir, also on April 24 and the Upper Canada Choristers with the Allenby Junior Public School Choir on May 1. On April 28 the National Philharmonic of Russia, conducted by Vladimir Spivakov, with pianist Denis Matsuev, is performing at Roy Thomson Hall; and May 3 the Vancouver Symphony Orchestra, conducted by Bramwell Tovey, with pianist Avan Yu, brought to us by the TSO, is performing, also on the Roy Thomson Hall stage.